Calcudoku is a variation on the killer sudoku variant of sudoku! It first appeared in the UK under the name kenken in The Times, and has also appeared under a range of other names such as KenDoku and hitoshii. Whilst puzzle names like sudoku and killer sudoku are always used for those particular types of puzzles, with calcudoku there is a much greater range of names because some of them are trademarked. Calcudoku seems to be the most popular name for the puzzle that is not trademarked, hence the title of the puzzle here. The rules of calcudoku are as follows: place numbers from 1 - 6 in each row and column exactly once (or 1 - n, where n is the width/height of the puzzle grid). Then, in each of the cages (marked with thick border lines) the numbers must sum to the total at the start of that caged region. However, unlike in killer sudoku where the sum is always an addition sum, in calcudoku you may be required to subtract, divide or multiply in addition to adding. Furthermore, you may repeat a number within a caged region in calcudoku, which is never allowed in killer sudoku. When performing subtraction and division, you must start with the highest number and then subtract/divide all the other numbers from that highest number. This is because order matters with subtraction and division, whereas it does not with addition and multiplication. We can supply a large range of calcudoku puzzles: whether you want to buy simple and quick 4x4 or 5x5 puzzles, or the standard 6x6 puzzle. For extra hard challenges there are 9x9 puzzles and even very interesting variants such as samurai 6x6 and even samurai 9x9 grids and more besides. If you would like to buy calcudoku puzzles for publication, then please do contact us with your requirements. 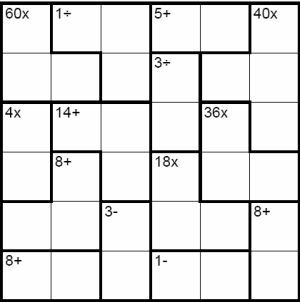 Publishers - Please contact us to buy Calcudoku puzzles for publication in your book, magazine, newspaper, any other printed media or online.